For a super-smooth treat, freeze in an ice-cream maker, preferably one big enough for 3 quarts. You can substitute orange flower water for rose water. Rinse pistachios, and pat dry with a paper towel to remove salt. Prep: 35 minutes; Cook: 5 minutes. 1. Bring first 3 ingredients and 6 cups water to a boil in a large, heavy, nonstick saucepan over high heat. Reduce heat to low, and simmer, uncovered, 5 minutes. 2. Remove pan from heat, add gelatin mixture, and stir to combine. Mix in rose water and lime zest; add just enough food coloring for a dark, warm, rosy hue, if desired. Transfer sorbet mixture to 2 (1-quart) preserving jars, screw lids on tightly, and cool to room temperature. Refrigerate until ready to make sorbet. 3. Transfer sorbet mixture to the freezer container of an ice-cream maker, and freeze according to manufacturer's directions. 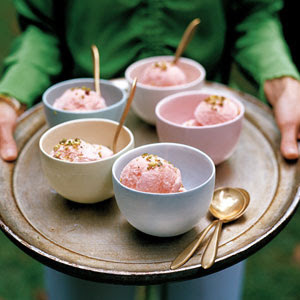 Store in freezer until ready to use, letting sorbet soften 15 to 20 minutes at room temperature before serving, or divide among individual serving dishes, top with pistachios, and serve immediately. Hi My name is Gabi and I am a nurse and mother based in Bristol, England. Moon to Moon has become my place to share my passion for chilled out, unfussy homes, hand made and vintage items and slow living.